In 2016 I attended a short course on Art and Photography, and part of the course was a project. 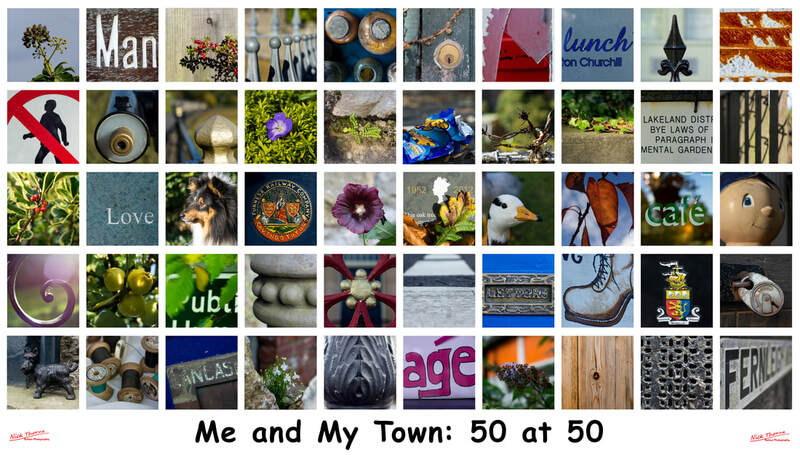 I’ve recently turned 50 and have lived in Grange-over-Sands longer than anywhere in my adult life. I therefore felt that my project should be about my photographic relationship with the town. I have 5,000 photos tagged with ‘Grange’, many taken for cards, posters or documents. I have always been interested in photo-montages, and have increasingly found urban abstracts in photography appealing. I have tried researching these themes in art photography, but have found little (montages in art terms seem to be mainly superimpositions or cut and paste collages). There are many suggestions for montage and themed projects and so on, but these tend to come from magazines or ‘unknown’ photographers rather than art photography. Such as ‘The Camera Points Both Ways’. Urban Abstract photography can be found on some Flickr sites. And it is from these that I tend to find most inspiration. I have also been intrigued by the typology photography, some of which is urban based; I particularly like the collections of objects by Michael Wolf, which is probably the closest to what I have tried to do. The other main strand of my life is walking (I am a rights of way officer) and walking and photography have been combined by many; one inspiration is Kel Portman and his ‘Walking the Land’ projects. Kel also advocates a more meditative style of photography, where you take fewer photos and spend more time looking for the right one. From all of these, I came up with the idea of taking abstract photos of my town at 50, photos of things that you would normally miss (myself included). And to do this, I borrowed Kel’s idea of taking photos at fixed points on a walk. This threw up a few challenges, such as getting the distance right, and having people look oddly at me for taking photos of things you wouldn’t normally be looking at closely. And because I wished to make them square, I had to tape off the edges of my LCD screen to create a frame! I’ve discovered that this activity even has a name in that when communal it’s ‘Photo Walking’. All-in-all I found it an interesting and enjoyable brief. For anyone who lives here, I challenge you to follow my route and find the photo sites! Let me know if you do.